Like Calypso, the minesweeper that Jacques-Yves Cousteau fitted out as a floating laboratory in the 1950s and which became a symbol and flag bearer of defence of the oceans, energy Observer aims to become an ambassador of green technologies and promote a new energy policy. Sailing all over the world incomplete energy autonomy and without emitting greenhouse gas or fine particulate matter. This is the challenge launched by the Energy Observer Team that left Paris for a round the world trip as ambassador of renewable, zero impact energy. Six years of navigation without using fossil fuels, 101 stopovers on a circumnavigation expected to last from 2017 to 2022, to coastal capitals and historic ports, nature reserves and major international events. It left the port of Saint Malo in spring 2017 and before tackling the oceans sailed round France from Paris to Monaco. Energy Observer has two objectives: to test and optimise the green technological innovations adopted to make them applicable on a larger scale, and also support start-ups, makers and communities that try to make the world a better place. Originally 24.38 m overall, Energy Observer has been modified and now measures 30.5 m overall and 12.8 in the beam. When she was built in Canada, in 1983, to a design by naval architect Nigel Irens under the supervision of navigator Mike Birch, she was the biggest catamaran in existence, changing the world of multihulls. Named Formula TAG, “avant-garde technique”, she was the first catamaran to set the record of 500 miles in 24 hours in 1984 and then won the Monaco-New York race. But it was under the name of Enza New Zealand that she had her best years, winning the Jules Verne trophy with Sir Peter Blake as skipper. In 2013 Frédéric Dahirel recovered the boat in Brest. His ambition was to create the first French catamaran propelled by wind and electricity, with the support of the Technitoit company. In 2015, Victorien Erussard join the adventure. The project was Energy Observer, with partners CEA-Liten and groups of private companies as sponsors. Since then, a team of about 50 people has worked to renovate and redesign this legendary catamaran. Hydrogen is the lightest chemical element in nature. At normal temperatures it is a highly inflammable gas that is light, colourless, odourless and non-toxic. Like all fuels, hydrogen contains a lot of chemical energy in its bond which can be extracted by making it react with oxygen. Pure hydrogen is rare in nature and is usually combined with other elements. To obtain hydrogen requires an extraction process that requires other energy. Currently almost all industrially produced hydrogen comes from fossil fuels. This is why its use on a large scale for industrial and individual use still demands research and development. It also occupies large volumes in standard pressure conditions. It is thus essential to develop technologies for compression and production independently of fossil fuels, and only in this way can it become an energy vector for the future. 1 kg of H2 (hydrogen) produces up to 142 million Joule: the energy needed to drive a car about 100 km or to boil 475 kg of water. A kilogram of CH4 (methane) produces only 56 million Joule. One of the obstacles to the development of hydrogen technologies is that it has such a low density it takes up a lot of space: 1 kg of hydrogen occupies 56 L, while a kilogram of petrol occupies about 1 L. Another obstacle is that gaseous hydrogen is not found on earth and has to be produced, with the problem of finding a source of energy. So it is a clean fuel only if the process that is used to produce it is clean. Hydrogen cannot be considered an “energy source” but is defined as an “energy vector”. Today hydrogen is produced from methane and fossil fuels, but there are other methods that permit alternative sources such as solar, wind and nuclear energy. But these involved difficulties that limit their use: they are too bulky, not constant or not concentrated enough. The evolution of a propulsion system using hydrogen and wind energy is based on the electrolysis of water, the passing of an electrical current through the water to produce gaseous hydrogen and oxygen. In this way costs can be considerably reduced and, at the same time, enough energy produced to be competitive with traditional methods. The electrolytic production of hydrogen requires banks of electrolysers and a source of electrical energy: this can be of any kind, but in the case of renewable sources there are no problems in terms of the omission of pollutant gases. They are thus hydrogen production technologies with zero environmental impact. Electrolysis is a well-known and mature industrial process that offers yields of the order of 75%. A “hydrogen vehicle” is any vehicle that uses hydrogen as a fuel. It can be any kind of vehicle, a car, plane or boat. This propulsion system may convert the chemical energy of hydrogen into mechanical energy into ways: burning the gas in an internal combustion engine or generating a chemical reaction in a fuel cell, producing electrical energy that powers a motor. Internal combustion engines are defined as HICEV (Hydrogen Internal Combustion Engine Vehicles), while the latter are known as FCEV (Fuel Cell Electric Vehicles). Fuel cells are fed by two flows: hydrogen from the negative pole and oxygen from the positive pole. When the atoms of hydrogen come into contact with the catalyser, the electrons separate from the nucleus and produce electrical energy. They then migrate towards the positive pole and combine with the oxygen atoms bringing a negative charge. The process is completed with the passage of hydrogen molecules (positive) towards oxygen molecules (negative) and this chemical reaction produces water. The Energy Observer aims to place technology and the environment at the centre of sustainable development and to demonstrate that it is possible to create an autonomous energy system in such a hostile environment as the ocean. It will also demonstrate that it is possible to achieve zero CO2 emissions in a hostile environment such as the sea and then extend the application to dry land. For the first time, Energy Observer, a boat of the future with a very high technological content, will produce in complete autonomy hydrogen from seawater using solar, wind and tidal energy. Besides being a messenger of green technologies and sustainable development, Energy Observer is a floating laboratory that makes it possible to bring technologies and experiments out of the laboratories. Energy Observer is an experimental platform that will make an unprecedented world tour using energies of the future to demonstrate the efficacy and the performance of the hydrogen chain in a hostile marine environment at all latitudes, and will validate its application on land and thus promote its development in other large-scale applications. The Laboratoire d’Innovation pour les Technologies des Énergies nouvelles et les Nanomatériaux (LITEN) du CEA, Commissariat à l’énergie atomique et aux énergies alternatives, has played a decisive role in the development of future technologies for energy transition. It has also contributed to the development of the Energy Observer project. A total of 30 researchers from CEA- LITEN, on the sites of Grenoble and INES (Institut National de l’Énergie Solaire) in Chambéry, met in January 2015 to develop all the technological innovations to be installed on Energy Observer. The Energy Observer, to face and win the challenge of a round the world trip in complete autonomy from fossil fuels and with zero emissions, has been equipped with latest generation, synergically connected systems . 130 square metres of photovoltaic panels combined with three different technologies: flexible, two-sided and walkable, for a total of 21KWc. 2 vertical axis wind generators for producing electricity on a mobile support with a total power of 2KW. Automated kite designed to increase boat speed and reduce fuel consumption; also allows electric motors to be converted to hydroelectric generators. Electrolytic system for breaking down water molecules(H2O) into oxygen (O2) and hydrogen (H2). The oxygen is released into the atmosphere, while the hydrogen is stored as a gas to store the excess energy 4 Nm3/h at 30 bar. Hydrogen accumulation tanks 2 m x 4 m containing a total of 322 L long-term or 62 kg of hydrogen. 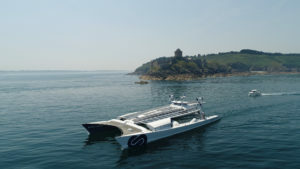 System of fuel cells to generate electricity from the stored hydrogen to extend the boat’s range, coupled with 22 kW absorption machine for air conditioning. 2 very high yield (97%) electric motors, that can be converted to hydroelectric generators when sailing under the kite. 2 x 41 KW at 3000 RPM in propulsion mode and 2 x 2.5 Kw in hydroelectric generator mode. All systems are monitored in real-time for performance, management and optimisation of energy flows on board also remotely. Navigation software has also been developed to optimise the course, not just as a function of the weather but also of the energy sources available (sun, cloud, hydrogen level).